The name Hunab Ku in Mayan means “The Only God”. Mentions of Hunab Ku are found specifically in colonial sources of Mayan history after the Spanish conquest. The name has been used in the famous book of Chilam Balam. Although it has been speculated that Hunab Ku is the equivalent of an older Mayan deity, recent research has shown that he was probably an invention of the missionaries in an attempt to indoctrinate the polytheist Mayans and bring them closer to the Christian conception of God. This may explain the fact that Hunab Ku finds no mention in pre-16th centuries historical sources from any of the Mayan cities. The earliest mention of Hunab Ku appears in a document penned down after the Spanish conquest in the 16th century. The document was penned by a Spanish source, so the author can be naturally expected to be non-Mayan. The mention of Hunab Ku in this book bears strong resemblance to the Christian concept of God. Hunab Ku is here deemed as the greatest Yucatan god who can’t be represented in any way because he lacks a form. In Chilam Balam, Hunab Ku is associated with the Mayan deity Itzamna. Before the Spanish conquest of the Mayan areas in the 16th century, no mention of Hunab Ku exists. From the thousands of extant sources such as stelas, ceramics, murals, frescoes and a few books and documents regarding the Mayan history, he is nowhere mentioned. Besides, we have sufficient evidence to believe that Mayans definitively believed in a polytheistic universe and didn’t have any conception of a single God. Therefore, it’s easy to conclude that the origin of this particular Mayan deity was the result of colonial literature, written primarily by the Franciscan monks after the Spanish conquest, and meant to convert Mayan people to Christianity. The conception of Hunab Ku as the ultimate deity certainly has its origins in the writings of Christian missionaries. Modern Mayan scholars have confirmed that Hunab Ku did not exist as a Mayan deity in pre-Hispanic era. It was only after the Spanish conquest that the concept was added to the Mayan pantheon. Researchers have further found significant parallels between the Christian concept of oneness, as manifest in the unity of Trinity, and the oneness associated with Hunab Ku. Some of the most noted anthropological experts have clearly defined Hunab Ku as a missionary invention. These experts have debunked the possibility that Hunab Ku hailed from the original pantheon of Mayan gods. And to make this clearer, researchers have shown parallels between Christian missionary conceptions of Trinity, and the oneness linked with Hunab Ku. According to these researchers, the very aim of the kind of oneness granted to Hunab Ku is to make him similar to the Christian God and thus, to bring Mayans closer to the monotheistic religion, which was the aim of the missionaries in the post-Spanish Mayan world. New Age authors revived and popularised the concept of Hunab Ku in the 20th century. Among the earliest to do so was Domingo Martinez Paredez who interpreted the monotheistic Mayan deity by associating it with the symbol of a square within a circle. Paredez further drew parallels between this interpretation and the Freemason concept of the universe being made by a Great Architect. This was an attempt to associated esoteric elements to the notion of a monotheist Mayan god. Paredez wrote about his ideas in a later book and they were later expanded on by Jose Arguelles. In ancient Mayan cities, Hunab Ku didn’t exist, so we don’t find any symbols associated with this particular deity among the early Mayans. This did not stop the New Age authors in the 20th century to proclaim the association of different symbols with Hunab Ku. As stated above, Paredez theorised that Hunab Ku was represented by a square within a circle, or a circle within a square. When Arguelles expanded on these ideas, he theorised that it was actually a rectangular design which was used by the Mesoamericans to refer to the ultimate deity. He further modified the symbol so that it appeared to include the yin and yang motif, and a circular design representing the galaxy. This design was used by Aztecs on their ritual cloaks and it has been found in a 16th century codex related to the Aztecs. 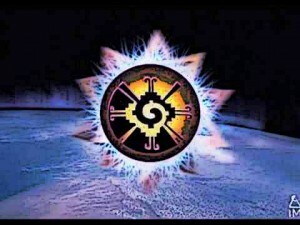 New Age authors have laid a great stress on the cosmic significance of the Mayan god Hunab Ku. Of course this significance is coupled with the insistence that Hunab Ku is an ancient god, whereas no such proofs exist in Mayan sources. Still, New Age authors believe that Hunab Ku was the original creator of the Universe and lived at the centre of the Milky Way galaxy. It has also been claimed that since Mayans were great astronomers, they looked at the stars and placed Hunab Ku at the centre of the universe. Again, MayanS had no original deity called Hunab Ku, so this assertion is misplaced. When New Age authors assert that Hunab Ku is at the centre of the Milky Way, they also ascribed a symbolic spiritual significance to this location. It is claimed that Hunab Ku shaped out the universe from a whirling disk and it is he who keeps giving birth to new galaxies and astral bodies. He is also deemed the originator of all consciousness in the universe. Hunab Ku is a rather controversial Mayan deity. Modern scholars believe that he was originally invented by the Christian missionaries after the Spanish conquest of the Mayan regions. The invention of a singular deity, whose name means “the Only God” in Mayan, was meant to bring Mayans closer to the monotheistic conceptions of Christianity. This is further affirmed by the fact that no earlier Mayan sources mention Hunab Ku or allude to an all-powerful deity with that name. Modern interest in Hunab Ku has been piqued after New Age authors started ascribing new symbols and meanings to Hunab Ku during the 20th century.